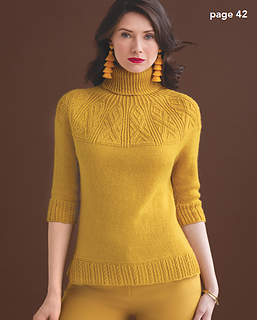 Norah Gaughans jewel-bright pullover, knit in Kelbourne Woolens Andorra, has a beautifully intricate yoke detail. The front and back lower ribbed sections are worked separately back and forth to create side vents, then stitches are joined to work body in the round to the underarm. Sleeves are worked in the round from the cuff to the underarm, then all stitches are joined to work yoke and neck.